Discussion in 'Discussion (AdGuard for Mac)' started by Tribulatio, Jan 13, 2018. 1) AdGuard does not see what happens with Cliqz, and thus cannot have any control of impact on it? 2) Cliqz does such a good job by itself before Cliqz can do anything that somebody using Cliqz browser does not need AdGuard? I thank you in advance for clarifications / explanations. Same thing here as with Opera Neon and my newest reply applies to Cliqz browser too - it's not included in AG for Mac's default filtered applications list, so for the time being just manually add it to the filtered applications list (like with Opera Neon). I'll also post this to the GitHub tracker to request Cliqz browser to be added to the default filtered applications list. Excellent! Thank you very much. Added. Interestingly, while I do now see trackers being blocked, still Cliqz seems to have less of them than other browsers. But I have to use it longer for being able to compare. I should say that Cliqz is a quite attractive browser. It is fast, doesn't freeze like some other secure browsers. Pleasant to use. I have just bought a lifetime license for my main Mac: AdGuard is really worth it. I may buy it for my other Macs, if my use is convincing enough. However, coming back to Cliqz, there seems to be a compatibility issue. Once I add Cliqz to the list of apps, access to most sites I attempt to visit is denied, with the claim the the security certificate is not configured properly. I can add exceptions for some, but not all. Hilariouly, Google is no longer accessible (security certificate not configured properly, the warning claims...) and no exception can be added. As soon as I uncheck Cliqz from the AdGuard preferences list, I can access all blocked websites again. Obviously, there is an issue in the interaction between AdGuard and Cliqz. Could you please test it and consider a solution? Thank you! You might try rebooting the Mac and see if AG for Mac installs the certificate needed for HTTPS filtering. If that doesn't work, it might be another issue with that browser (honestly, I've never heard of that browser until now) and something the AG devs will need to add support for in AG for Mac. Thank you very much. I have reactivated Cliqz in the list of apps in the preferences, rebooted my Mac, but it does not solve the issue: all sites are blocked due to allegedly invalid security certificates (including AdGuard, by the way, or Bing). As soon as I uncheck Cliqz in the list, it comes back to normal. OK, for the time being, I will use that browser without AdGuard. It would be a good idea to pay attention to it, however: it seems to be (modestly) gaining in popularity, for instance in Germany, and it looks like an attractive option, I can say after using it intensively for 2 or 3 days. Oh, I see now. Cliqz is based on Firefox so it likely uses its own certificate store and thus needs the AG certificate to be manually imported currently until AG for Mac adds support for it. I'll test this in a couple minutes and see if I can get it working. Yes, indeed, I should have mentioned that. Thank you for testing. Step 1) Go to the Cliqz menu then Preferences... to open the browser's settings. Step 2) Click on the Privacy & Security section on the left side and then scroll down to the bottom of this section to Certificates. 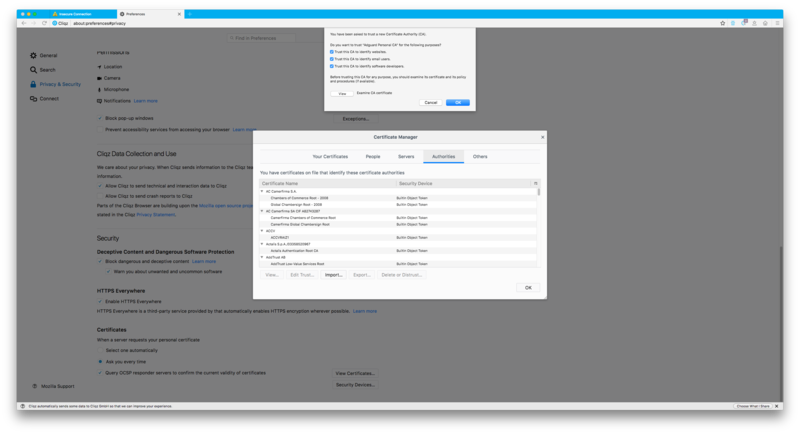 Step 3) Click the View Certificates... button. 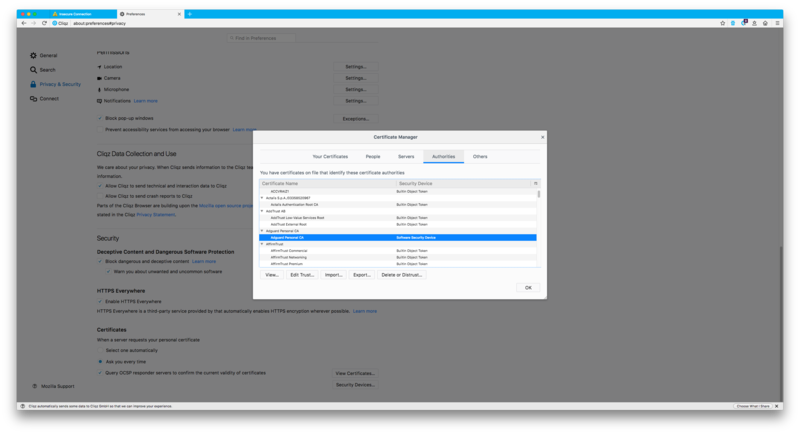 Step 4) With the Certificate Manager open, under Authorities, click the Import... button on the bottom. Step 5) When the Finder file open dialog opens, at the top where the drop down menu is, click the drop down menu then select the main macOS drive (by default called something like Macintosh HD or perhaps Mac HD). Step 6) Once in the root of the main Mac drive in the file open dialog, open the Library folder and once inside open the Application Support folder. Now once inside the Application Support folder, next open the com.adguard.Adguard folder and then the NfApiConfiguration folder and finally the SSL folder. Inside you will see a file called Adguard Personal CA.cer which is what we're looking for. Step 7) Now, click on the Adguard Personal CA.cer file and select the Open button in the file dialog. Step 10) Click OK in the Certificate Manager, close Cliqz's preferences and try opening a HTTPS website like google.com and it should work now. Thank you very much for your very clear and detailed, step-by-step, explanations! I have done exactly as instructed - and it is working indeed. Very kind of you to have taken the time to let me know how to do it. This is great help, much appreciated!